Solar For All is sponsoring a design contest for manufacturers and PV system integrators to develop a “perfectly” designed and adapted solar PV system for rural electrification. The winner receiving a $250,000 investment by Deutsche Bank Americas Foundation. 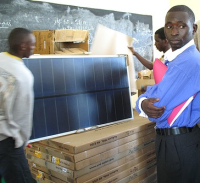 Innovative PV off-grid power supply solutions for low-income end-users in developing countries. These may be solar home systems, mini-grids, hybrid solutions or PV systems with special applications as long as they produce AC or DC power and are focused on end-users. Market-based approaches with business plans, market penetration strategies, or end-user financing – applicants may focus on one or on several of these aspects.